Lemon tree, very pretty, but the lemon roots are ... shallow. It doesn't make a pretty rhyme, but it's a helpful fact for a gardener making decisions about planting, watering and mulch. Whether you select an ordinary lemon tree (Citrus limon) or an "Improved Meyer," you'll need to get to take care of the roots before you begin counting your fruit. 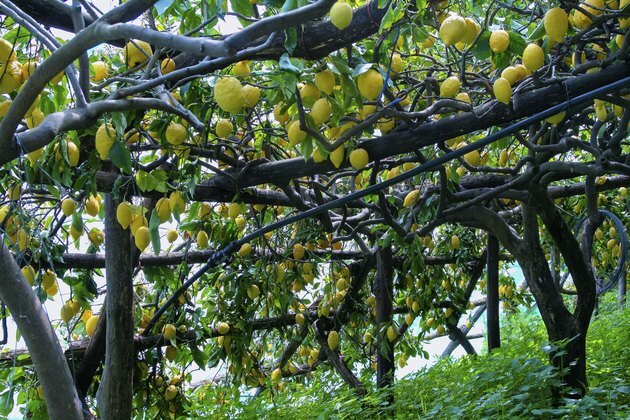 Abundant lemon trees growing in a grove. Growing lemon trees won't present many problems if you're lucky enough to live in a warm climate. They are generally easy to grow and they light up your backyard with exquisite white blossoms, intoxicating fragrance, brilliant yellow fruit and year-round foliage. These little beauties grow outdoors in U.S. Department of Agriculture plant hardiness zones 9 through 11, but you can grow a container plant in far colder climates. Your primary concern is to get the roots the nutrients they need when they need them. You have to take the lemon tree's root structure into account at every stage of planting and growing. The roots stay largely in the top 24 inches of soil, because a system of woody roots develops laterally from the trunk in all directions, traveling horizontally well beyond the drip line of the tree. Bunches of fibrous roots grow from the woody roots, and it is these that have primary responsibility for obtaining water and nutrients for the plant. Root growth takes place in "flushes" that occur from February through November. Failure to protect provide adequate water during these flushes can kill a lemon tree, but too much water can also be dangerous. When you are placing that root ball into the hole you have prepared, keep those roots in mind. Given the spread of the root system, make the hole as deep as the root ball but no deeper, and at least twice as wide. Lemon trees require well-draining soil, so amend heavy soil by working in several inches of compost or creating a raised bed. The top of the root ball should sit just above the soil line. You'll need to keep the root ball moist but not wet until the roots expand into the surrounding soil, so water several times a week, close to the trunk, in the months after planting. Once the tree is mature, you should water further from the trunk about once a week, allowing the soil to dry out between waterings. Think of mulch as the soft blanket you tuck around your tree to protect it. Although mulch can consist of virtually any material layered over the soil beneath a plant, lemons do best with organic compost or chopped, dried leaves. Spread a 4- to 6-inch layer over the soil in the root zone area, keeping the mulch a few inches from the trunk. The material keeps down weeds, regulates the soil temperature and eventually disintegrates into the soil, providing nutrients for the tree. It's also a good idea to remove all lemons that form the first few years to allow that energy to be used to strengthen the root system. Healthy lemon trees growing in healthy soil generally have few pest problems. But pests and diseases that live in the soil can damage a lemon tree's roots. The two worst offenders are the citrus nematode (Tylenchulus semipenetrans), and the bacteria causing fibrous root rot, Phytopthora parasitica. You can help your lemon tree roots avoid these issues by giving spacing them at least 12 feet from each other and from other trees. This prevents pests from traveling from one tree to another and also limits canopy shading of the soil, which encourages pest populations.